The global laboratory information system market is predicted to grow to USD 3.2 billion by 2024, growing at a CAGR of 8.5% during the forecast period. Different products such as integrated an standalone are majorly contributing to the laboratory information system market size. Laboratory information system (LIS) is a software solution which manages the obtaining, handling, and storage of information created by laboratories. It helps to simplify laboratory processes to decline specimen handling time, enhance turnaround time, and upsurge productivity. Based on product, the laboratory information system market is categorized into standalone and integrated, of which standalone system holds the larger share in the market, globally due to technological innovation and upsurge in cloud-based laboratory information system. The decrease of the separate maintenance and service charge of these LIS solutions led to the fastest growth of the integrated segment during the historical period, which is also predicted to continue during the forecast period. Based on the component, the laboratory information system market is categorized into software and services, of which software hold the largest share in the laboratory information system market, globally. An essential type of these services such as software upgrading, training, and software maintenance post-installation along with obtainability of innovative LIS services by key players led to the fastest growth of the services segment during the historical period, which is also predicted to continue during the forecast period. On the basis of the delivery mode, the laboratory information system market is segmented into web-based, on-premise, and cloud-based. Of all, the on-premise category accounted the largest share in the laboratory information system market due to customization characteristic of this delivery mode, and data securities. On the basis of the end user, the market is segmented into hospital laboratories, physician office laboratories, independent laboratories, and others. Of all, the laboratory information system market size for the independent laboratory is expected to grow at the fastest CAGR of 9.4% during the forecast period, globally. In addition, of all end users, hospital laboratory accounted for the largest share of the market. The increasing occurrence of chronic diseases, expanding geriatric population, escalating demand for quality and precision of laboratory diagnosis, reimbursement scenario for laboratories in the U.S., mounting personalized medicine initiatives, expansion of novel and innovative products, expanding awareness of LIS, mounting requirement for integrated healthcare system, and government schemes to support healthcare IT are the key factors leading to the growth in the laboratory information system market, globally. Owing to the mounting occurrence of chronic diseases and expanding geriatric population the demand for quality laboratory diagnosis is escalating for the management and diagnosis of diseases. Some of the other key factors driving the growth of the industry are the mounting requirement to limit diagnostic errors, intensifying penetration of mobile applications in healthcare solutions, advancement in technology, and mounting incorporation of laboratory information systems (LIS) and EHR systems. Key factors hindering the growth of the laboratory information system market are the high cost of LIS, interoperability and technical issues. In addition, the dearth of skilled professionals and requirement of specialized laboratory units for chemistry, hematology, and microbiology is also having a negative impact on the growth of the market. Geographically, North America is the largest laboratory information system market as in the region the occurrence of chronic diseases is increasing, regulatory mandates in the U.S., and mounting personalized medicine initiatives. In addition, mounting initiatives by government and industry players in healthcare IT, expanding need for quality cancer diagnosis, the mounting requirement for the integrated healthcare system, and escalating healthcare spending are also fueling the growth of the North American laboratory information system market. 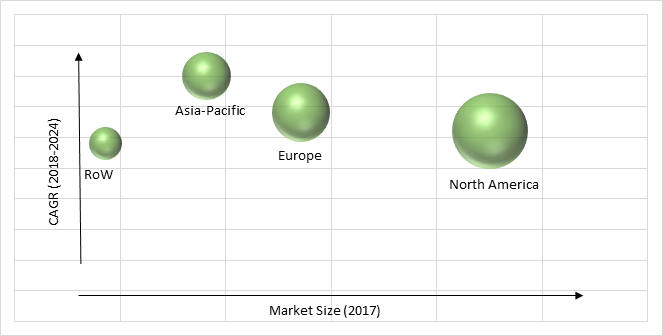 Asia-Pacific is observed to witness significant growth in the laboratory information system market during the forecast period, as the region comprises of a large population, cancer diagnostic initiatives, mounting requirement for the integrated healthcare system, escalating awareness of LIS, and mounting EHR adoption. Moreover, intensifying healthcare expenditure, government schemes to increase healthcare IT, refining healthcare infrastructure, and mounting occurrence of chronic diseases are also facilitating the significant growth of Asia-Pacific laboratory information system industry. Market players in the laboratory information system industry are investing capital to develop technologically advanced systems. In April 2018, SCC Soft Computer and Australian Red Cross Blood Service have introduced an implementation study to assess SCC’s laboratory and genetics information management systems. Cerner Corporation, SCC Soft Computer, Mckesson Corporation, Compugroup Medical AG, EPIC Systems Corporation, Computer Programs and Systems, Inc., International Business Machines, and Orchard Software Corporation are some of the key players offering solutions for laboratory information system.